Stone and siding create a striking facade to this house plan, and an arched portico mirrors the graceful curves of exterior windows. Multiple gables and an angled courtyard garage spark instant curb appeal. French doors and windows usher in light and views, while columns and a fireplace complement the cathedral great room. The spacious gourmet kitchen features an angled island, and is open to the great room and cathedral dining room. A generous walk-in pantry is located nearby. Accented by a banquette and French doors, the dining room leads to a screened porch and adjacent side porch. 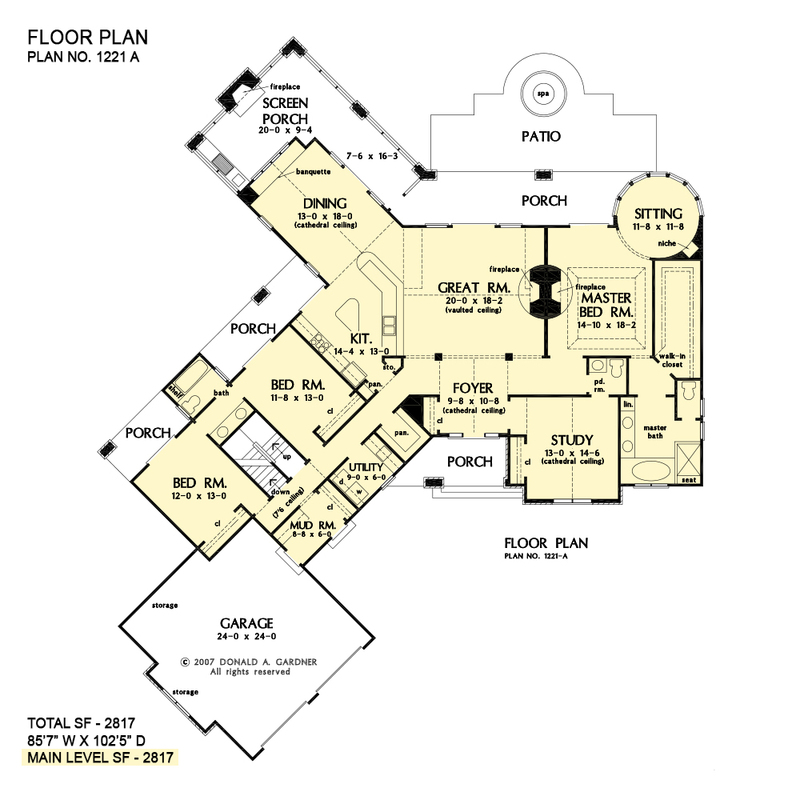 Located in the rear of the house plan for privacy, the exquisite master suite includes an intimate circular sitting nook, fireplace, porch access, huge walk-in closet, and well-appointed bath. Two bedrooms share a dual-vanity bath and a versatile study/bedroom in the front of the home creates optimal space for a home office or library. Numerous porches provide an abundance of space for outdoor living, including the screened porch with fireplace and summer kitchen, perfect for alfresco dining and entertaining. 1st Floor: 2817 Sq. Ft. 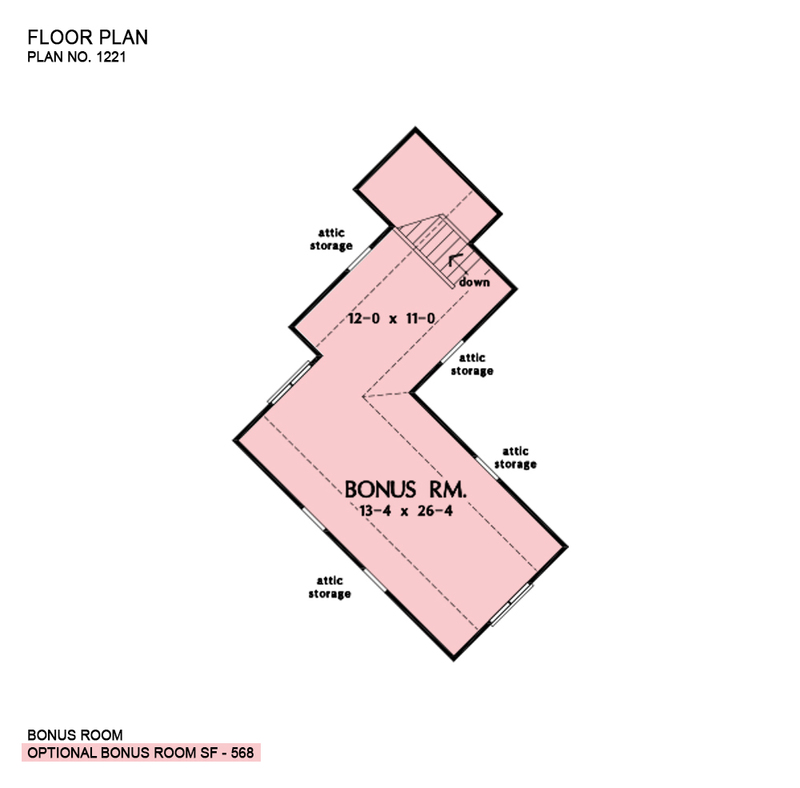 Bonus Room: 568 Sq. Ft.
House Dimensions: 85' 7" x 102' 5"
Great Room: 20' 0" x 18' 2"
Master Bedroom: 15' 0" x 18' 2"
Bedroom #2 (Flat): 11' 8" x 13' 0" x 9' 0"
Bonus Room (Clipped): 13' 4" x 26' 4" x 8' 0"
Dining Room (Cathedral): 13' 0" x 18' 0" x 13' 6"
Foyer (Cathedral): 9' 8" x 10' 10" x 21' 10"
Garage Storage (Flat): 15' 4" x 2' 0" x 0' 0"
Garage Storage Bay (Flat): 2' 0" x 11' 4" x 0' 0"
Great Room (Vaulted): 20' 0" x 18' 2" x 17' 6"
Kitchen (Flat): 14' 4" x 13' 0" x 9' 0"
Master Bedroom (Tray): 15' 0" x 18' 2" x 10' 6"
Mud Room (Flat): 8' 8" x 6' 0" x 9' 0"
Patio - Rear (None): 32' 0" x 11' 0" x 0' 0"
Porch - Rear (Flat): 33' 6" x 7' 8" x 9' 0"
Porch - Front (Flat): 14' 0" x 7' 0" x 11' 0"
Porch - Left (Flat): 19' 6" x 6' 0" x 9' 0"
Porch - Screen (Flat): 20' 0" x 9' 4" x 9' 0"
Storage (1st Fl.) 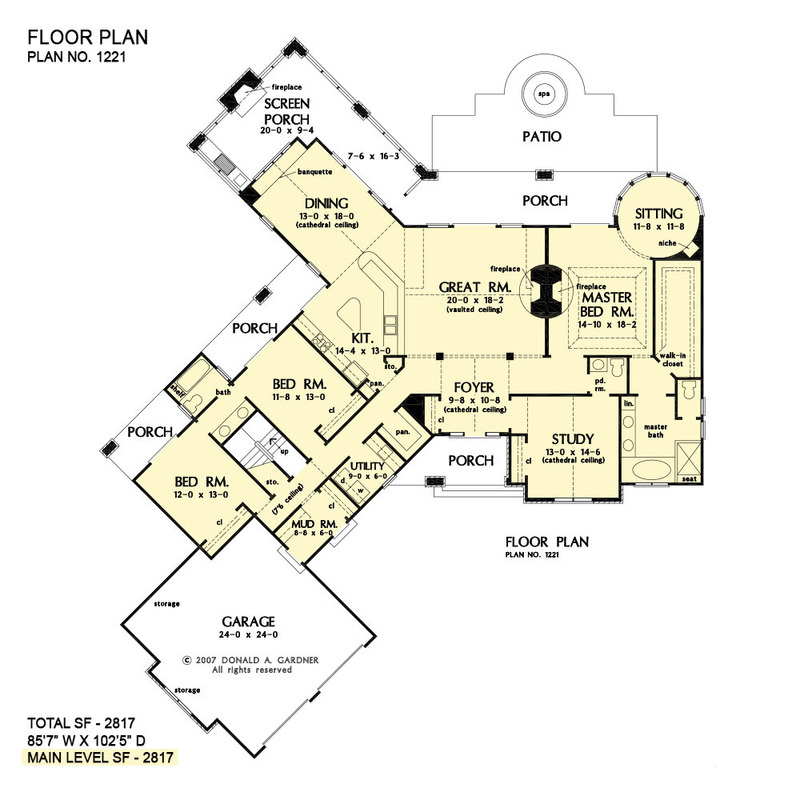 (Sloped): 3' 4" x 4' 0" x 9' 0"
Storage (Other) (Flat): 1' 7" x 1' 7" x 9' 0"
Study (Cathedral): 13' 0" x 14' 8" x 13' 6"
Utility Room (Flat): 9' 0" x 6' 0" x 9' 0"